‘it cannot be right that a funding ‘dip’ exists for students between the ages of 16 and 18, only to rise again in higher education’. The letter adds that ‘successive governments have failed to give further education the recognition it deserves for the role it pays in our national productivity puzzle’. The Committee is currently conducting an inquiry into the level and distribution of school and college funding and last week heard from a panel on the current issues faced by the FE sector. 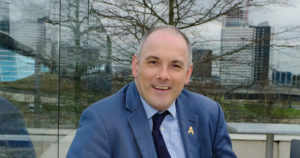 AoC’s new President Steve Frampton MBE has outlined four key priorities in his year ahead following the start of his tenure this month. Steve Frampton, who has a lifelong passion for post-16 education, took over from his predecessor Dr Alison Birkinshaw OBE on 1 August 2018. His extensive career has been recognised at the highest level, with Steve being awarded an MBE for Services to Education in the Queen’s New Year Honours 2017. Aside from working in colleges since the 1980s, he has been the director of several local community charities, including Business South and PiTC – the community arm of Portsmouth Football Club. An innovative multi-million pound fund to boost the quality of education offered across the further education sector has been launched by Skills Minister Anne Milton (28 June). Speaking at the Association of Colleges conference, the Minister announced the main phase of the £15million Strategic College Improvement Fund (SCIF), which will partner strong colleges with those in need of improvement –to share best practice and drive up standards. Colleges that need support to improve will be able to apply for a grant to work with a stronger ‘partnering’ college and together they will create an action plan to tackle the issues they face. We want to improve the quality of education for everyone. It is vital that all further education and sixth form colleges are able to give people the skills and knowledge they need to get on in their life and succeed in the workplace. I’m really thrilled to announce the next phase of the £15million Strategic College Improvement Fund. This fund will enable colleges to work together to improve standards across all colleges. The launch of this fund follows a successful pilot phase, which saw fourteen colleges receive grants totalling over £2million. Outcomes from the pilot included colleges reporting that the fund built awareness of good practice, fostered mutual learning and enabled rapid action to improve quality. This move follows the launch of the National Leaders of Further Education and National Leaders of Governance programmes, which also aim to spread the expertise seen in the top colleges across the country. The government is launching a review into how the current system of funding for FE meets the costs of “high-quality” provision, Anne Milton has revealed. The skills minister announced the plans in the House of Commons today during educations questions after she was asked what the Department for Education had made of “recent trends” in education funding for 16- to 19-year-olds. Alongside the post-18 review of education funding, she said: “We are also looking at the efficiency and resilience of the FE sector”. “We need to make sure that existing and forecast funding and regulatory structures meet the costs of high-quality, first-class provision,” she continued. In this episode of the Tes FE Podcast. They discuss employer and FE partnerships in the delivery of apprenticeships, question whether lowering the voting age to 16 is something the sector should be promoting and chat about the age at which they felt like they became a grown-up. A report by the Association of Colleges (AoC) has revealed how financially important the international market is for many UK colleges. Ninety colleges were asked what top five countries were most important to their international work. “The most popular by a long way was China but there was a strong presence of EU27 countries”, the report emphasised. International work is financially appealing to many colleges, “The combined international and EU income reported in 2016-17 was nearly £57 million”. AOC’s international director Emily Meredith has said that international recruitment forms a part of international work for some colleges. Yet Ms Meredith warned how “The first hurdle to overcome is any perception that the Brexit vote means the country is closed for business”. This is because after China, Italy, Germany, Spain and France are key markets that UK colleges recruit from. The FE Commissioner has new powers to trigger formal intervention, under tougher plans to enter colleges before they hit rock bottom. According to a new intervention policy published by the Department for Education, the FE Commissioner, Richard Atkins will now be able to take formal action at a college that isn’t yet failing, but where a “diagnostic assessment” has revealed it is in danger of doing so. Previously intervention could be triggered in one of three ways: a college being rated ‘inadequate’ by Ofsted rating, or ‘inadequate’ for financial health or control by the Education and Skills Funding Agency, or for failing to meet the DfE’s minimum performance standards. This new “escalation” process – which will happen before a college hits one of these markers for failure – will occur where “action is required quickly, which is likely to include leadership and governance change”. Thank you to all of you for giving me the opportunity to speak here today. My professional background before I entered politics was in the NHS: I trained as a nurse and worked in the NHS for 25 years. But I have to say that it is hard to think of a group of professionals delivering a more important public service than the people in this hall today. A profession caring for young people and old people – changing lives. I would like to start by briefly sharing some of my memories from the WorldSkills competition which I attended a few weeks ago. I have to be honest, I was completely blown away by Team UK. They did fantastically well – competing on the world stage for skills and achieving great things. And I came away thinking that WorldSkills is probably one of our best kept secrets – and in all my time in politics there are few things that have impressed me so much, and on so many different levels. New research by Tes has found that a growing number of FE colleges are looking to charge fees on a par with leading universities. According to data from the Office for Fair Access (Offa), 13 further education colleges will be permitted to charge a maximum fee of £9,250 for 2018-19. A further 13 plan to charge £9,000 per year for at least some of their HE provision. In 2015-16, nine colleges charged £9,000 – the maximum allowed at the time. Institutions charging more than £6,000 for courses have to establish an access agreement with Offa. The most recent figures show that 85 FE institutions have such an agreement for 2017-18 – an increase from 62 in 2016-17.